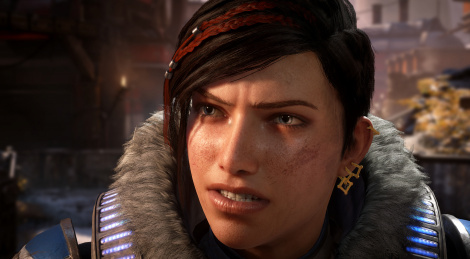 Gears of War 5 was on of the centerpiece of Microsoft's press conference, and as expected the game looks quite good. Here it is in 4K high quality captured straight from MS's feed at the conference. Loved this trailer - Microsoft's conference was really excellent with really great trailers, best conference they ever did. This already looks much better than Gears of War 4, which is a really good game. So I'm expecting this to be really great. Oh my god they may have actually made a gears game with compelling characters and story! Although the faces move a bit weirdly. Especially the woman. I just hope it isn't as safe as gears 4 and they push the gameplay a bit more. Less rigid combat etc. Didn't really care for the story in Gears. That wasn't what that game was about to me. Reminds me of God of War in that it looked a visual treat, and it was more about the journey and going through an interesting world with really decent combat. Story was always secondary. What a game should be, basically. I do agree that the gameplay and world exploration almost always trump story in the genre of gaming. Story helps but great gameplay and a fun beautiful world to explore are such a great treat. Looks decent. It was a rather predicatable announcement, although three Gears games wasn't, but at least they have a female protagonist. In fact, gears has been decent with its female characters, considering its macho content / origins.